This report was based on the presentation and analysis of some issues related to the right to freedom of expression and information, in order to assess related general policies of state institutions, including the legislative establishment. The report reviews violations documented accordance with the monitoring and documentation methodology of AFTE, in the period from 26 June to 25 September 2018, analyzing their patterns, with a view to demonstrating the impact of public policies on the right to freedom of expression. The report involves a presentation and analysis of the third quarter of 2018, beginning from the first of July and ending at the end of September. This period witnessed renewed debate on amending the articles of the constitution to allow El Sisi to continue in office for a longer period than his second term, which ends in 2022. The report attempts to review developments in the constitutional amendment process. The report tries to explain the impact on freedom of expression and the authority’s practices towards critical and opposing voices; reviews the state of freedom of expression by referring to the President’s ratification of the media laws and the combating of information technology crimes, and the regulations and legislations imposed by these laws to limit the freedom of media and digital rights and to prosecute journalists and activists with a large number of penalties and obstacles. In addition, the report sets out a section to highlight the evolution of media security activity by tracking new acquisitions by the Egyptian Media Group, the latest of which was the acquisition of the CBC network during the reporting period. The second section reviews the patterns of violations in three areas – freedom of information, digital rights, and freedom of creativity – to reach conclusions, which acquaint the reader with the motives of authorities in violating freedom of expression. In view of the importance of violations documented by the Monitoring and Documentation Unit of AFTE, they are attached in detail to this report. 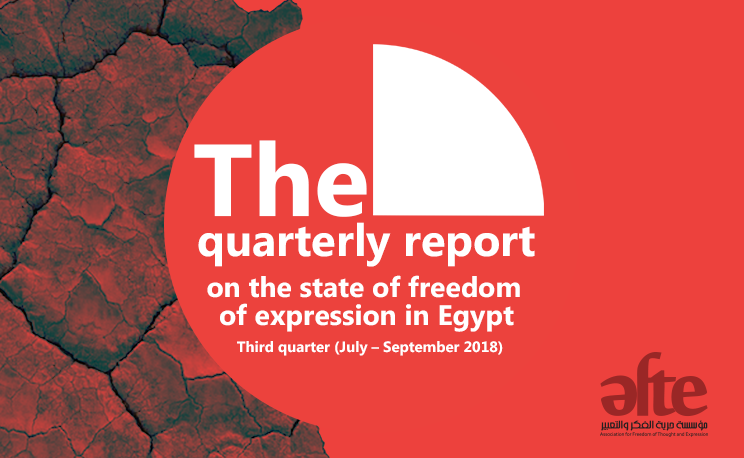 The report concludes with a number of recommendations made by AFTE to the concerned state authorities as well as to target groups and groups that are engaged in discussions with Egyptian authorities to protect and promote freedom of expression and information. This report is the last in the 2018 quarterly reports, and the next report will be the annual report for 2018, to be released by AFTE at the beginning of 2019. In its first section, the report highlights a number of pressing issues during the third quarter of 2018, in order to understand developments at the policy and legislative levels that relate to freedom of expression. The report proceeds from claims to amend articles of the Constitution, so as to extend the term of President El Sisi to 6 instead of 4 years. In general, ensuring that El Sisi remain in power for a longer period of time is a current major objective of the Authority, for which it imposes great obstacles and restrictions on freedom of expression, so that opponents and activists defending democracy cannot rally citizens against these amendments. The demands to amend the presidential term cannot be seen as a new event in Egyptian political life. These claims existed prior to the last presidential elections and were aimed at ensuring that El Sisi remain in power until at least 2026, i.e. to extend a presidential term to six years, renewable once. Alaa Abed, head of the parliamentary Human Rights Committee called for amending the constitution in 2017, so that the years of the presidential term would be increased to six years. MP Ismail Nasruddin called for the same. The current authority may not have been able to amend the constitution before the presidential elections, so the talk has been revisited after President Sisi was reassured of his victory in the presidential elections after removing his main rivals. Former chief of staff of the armed forces, Sami Annan, is in detention and subject to military investigations, while former Prime Minister Ahmed Shafiq has not appeared in any political events since he was ousted from running in the last presidential race. The Chairman of the parliamentary committee on Culture and Information, Osama Haikal, on 5 August 2018, said that the 4-year term of the presidency is a short period, and must be changed, while it is important to maintain the maximum limit of a two term presidency. In another statement, Heikal stressed that sooner or later the constitution must be amended, because some articles are impossible to implement. “The Brotherhood’s bet is on the post-Sisi period, whether it ends in 2022 or extended by the people’s will to 2024,” wrote Yasser Rizk, a journalist close to the presidency, indicating a tendency in the backrooms of the current power to make a constitutional amendment allowing the continuation of the President in power. It is expected that parliament will address the amendment of the articles of the presidential term during the cycle, which began in October 2018, according to a report published by the website of Mada Masr. Despite the plurality of voices calling for amending the constitution, there were also opposing positions. The Conservative Party’s Assistant for Political Affairs issued a statement saying that “the amendment of the constitution in this period is a distortion of the popular will. Talking about amending the article concerning presidential terms is a twisting of the will of the voters who approved the constitution and those who elected the president for a second term of 4 years; a prejudice to the constitutional texts is a violation of the state”. The Conservative Party has six seats in the House of Representatives out of a total of 594 seats. The continuing attempts to amend articles of the constitution have likely affected the state of freedom of expression in Egypt during the period covered by the report, in which prominent opposition activist Masoum Marzouq and several other activists were arrested on 23 August 2018 after Marzouk announced his call for a referendum concerning El Sisi’s remaining in power. This group, which also includes academic Yahya al-Qazzaz, is still in pre-trial detention and has been charged by the Supreme State Security Prosecution, in case no. 1305/2018, of participation with a terrorist group in achieving its objectives and receiving foreign funding for this purpose. These charges show the continuation of the crackdown on dissidents known to be affiliated to the Nasserite tendency, who have not been accused by El Sisi before of supporting terrorism. It seems that the calls of Massoum Marzouk caused great discomfort in the midst of ruling circles, which seek to keep the president in power until after the end of his second term in 2022. It can be said that the desire to suppress dissenting voices is reflected in all aspects of freedom of expression, which is discussed in detail later in this report. Activists, who use the Internet as a means of voicing their views on the current authority, continue to suffer pre-trial detentions. Blogger Wael Abbas is one of the most prominent of these activists, as well as activist Amal Fathi, who was sentenced by Maadi Misdemeanor Court to two years imprisonment, a bail of 10,000 pounds and a fine of 20,000 pounds to suspend the sentence until the appeal was approved on September 29, 2018. Fathi’s charges are related to a video she posted on Facebook where she criticized the current regime. On the other hand, President Sisi ratified four new laws, with the aim of controlling the media and the Internet, while intelligence agencies continue to acquire television channels owned by businessmen, through companies created with the funding and management of security bodies. Thus, the current practices of the Authority are no longer limited to their fears of protests against them, as much as they focus on preventing any opposition to amending the Constitution, in order to ensure that El Sisi remains in power. Law on Combating Information Technology Crimes, No. 175 of 2018, published in the Official Gazette on 14 August 2018. Law regulating the press and media and the Supreme Council Media Regulation, No. 180 of 2018, published in the Official Gazette, on 27 August 2018. Law of the National Press Authority, No. 179 of 2018, published in the Official Gazette, on 27 August 2018. Law of the National Information Authority, No. 178 of 2018, published in the Official Gazette on 27 August 2018. In accordance with Article 7 of the IT Crimes Act, investigating authorities have the authority to order the blocking of sites. The matter shall be submitted to the competent court within 24 hours. The court shall issue its decision of acceptance or rejection within 72 hours. The police may request the blocking of sites from the NTRA, upon which the security apparatus shall immediately notify the service providers of the blocking, in the case of urgency if there is imminent danger or damage from the commission of the crime. The police shall release a report documenting this intervention. The procedure shall be presented to the investigating authorities within 48 hours, which shall submit it to the competent court in accordance with the same procedure described above. Article (2) of the IT Crimes Law obliges telecommunications companies to save and store customer usage data for a period of 180 days. This includes user-identifiable data, data on the content and type of information system, and those relating to the flow of use and the devices used. This means that service providers will be able to know of user practices, including phone calls and text messages, websites visited, and applications used. The article also requires service providers to commit to the maintenance of “other data”, if a request thereof is made by NTRA Board of Directors. This means that telecommunication service providers may be obliged to save data not provided for in the Act. The same article gives national security bodies the authority to access these data, and obligates service providers to provide the technical facilities therefore. The law defines National Security bodies to include the Presidency, the Armed Forces, Ministry of the Interior, the General Intelligence and the Administrative Oversight Authority. Article 24 of the Anti-IT Crimes Act allows for the tracking of sarcastic pages and accounts described in the article as “the fabrication of sites, special accounts and e-mail”, so that the penalty in the case of the creation of a mail, account or site and its false attribution to a natural or juridical person or a special legal entity may amount to three months imprisonment and/or a fine of not less than 10,000 pounds, and not exceeding 30,000 pounds, even if no harm is caused. In case of harm, the penalty shall be a term of imprisonment of not less than one year, and/or a fine between 50,000 and 200,000 pounds. If the defendant falsely attributes an email, site or artificial private account to a public legal person, such as government ministries, agencies and companies, the penalty shall be imprisonment and a fine between 100,000 and 300,000 pounds, even if this does not result harm. In accordance with Article 19 of the Press and Information Regulation law and the law of the Supreme Council for Media Regulation, a website is blocked if it publishes or broadcasts false news or promotes or incites a violation of the law, violence or hatred, discriminates between citizens, advocates racism or intolerance, includes defamation or slander of individuals or contains insults to religions or religious beliefs. These charges are all loose and vague, making them a means of expanding the blocking of sites. Article (19) also gives the Supreme Council for Media Regulation the power to block personal accounts with 5000 or more followers, as well as blogs, according to the same charges against sites. Article (7) of the National Media Commission Law stipulates that the President of the Republic shall choose three persons for the membership of the Commission, including the Chairman of the National Media Commission, out of a total of 9 members. This means that the President directly appoints one third of the members of the National Information Commission. Article (7) gives the Ministry of Finance, the Council of State and the Telecommunications Regulatory Authority the authority to select a member for each of them separately, while the media union, the press, printing and the bureau of the House of Representatives have to nominate one member for each of them, provided that each of these entities nominates twice the number required of them so that the president can select the required number. It is also required that the nominations be sent within three months of the request, and if not sent, the President of the Republic shall complete the names taking into consideration the category they represent, upon nomination by the House of Representatives. This means that the executive authority, through the President of the Republic, directly controls the formation of a national media body, a matter which challenges its independence. Article (7) of the National Press authority regulates the formation of the Commission, which includes nine members from which the President chooses three members, namely the Chairman of the Commission and two experienced and public figures, while the Council of the Journalists Syndicate selects two members, the House of Representatives, and the Council of general union of Press, Printing and media workers shall nominate a member for each of them. In the last three months of the term of office of the Commission, they shall nominate twice the required number for the President of the Republic to choose from them. In the absence of such nominations by these bodies the president will directly select them. The Minister of Finance also selects a representative of the Ministry of Finance, and the Supreme Council of Administrative Affairs of the State Council elects a Vice-Chairman of the Council of State for membership of the Commission. Thus, the President of the Republic has the upper hand in the formation of the National Press Agency, which undermines its independence from the executive branch of authority. The previous review of some repressive laws of freedom of expression shows some of the problems that will have a major impact on the work of press and media institutions, as well as on the use of the Internet in the coming years. In parallel with the enactment of legislation restricting freedom of information, security bodies continue their activity in media business deals. The Egyptian Media Group announced that, on September 10, 2018, it had acquired 51% of the shares of the Future Holding Media and Communications Group, which issued a statement that “This partnership aims to unify the efforts exerted to provide distinctive media services in the Egyptian and Arab markets, which came in several stages by the two groups in the framework of a new structure, resulting in a larger entity benefiting Egyptians and all Recipients of Media Services in the Arab Region “. The deal resulted in businessman Mohammed Al-Amin joining the Board of Directors of the Egyptian Media Group. Mohammed Al Amin was the Chairman of the Future Group, in which he holds the majority of shares. The Future Group owns the CBC network channels. Thus the Egyptian media group has come to own CBC channels, in addition ON and Hayat channel as well as administers El Nil radio network. A report by Mada Masr, which has been blocked since May 2017, revealed that “Eagle Capital Financial Investments LLC” chaired by Dalia Khorshid, former Minister of Investment, is preparing a direct investment fund, Private Equity Fund, that is owned by Egyptian General Intelligence Service, which was established to manage all of the Portfolio Management’s civilian investments in a large number of companies, partially or wholly owned by Intelligence. Eagle Capital acquired the Egyptian Media Group in December 2017, and the Supreme Council for Media Regulation did not investigate the sources financing the deal, according to a previous report published by AFTE. Returning to the comments of businessman Ahmed Bahgat, owner of Dream channel, it was said that the Dream channel is about to enter into partnership with some state body. Bahgat most likely is referring to Egyptian General Intelligence, which owns the Eagle Capital Group, which owns the Egyptian media group, which seems to have lately become a major tool in the acquisition of television channels and other media outlets. AFTE fears that security bodies will control the media market in Egypt through its ownership of media companies, especially with the issuance of new media laws, which set complex conditions for the creation of new media outlets.